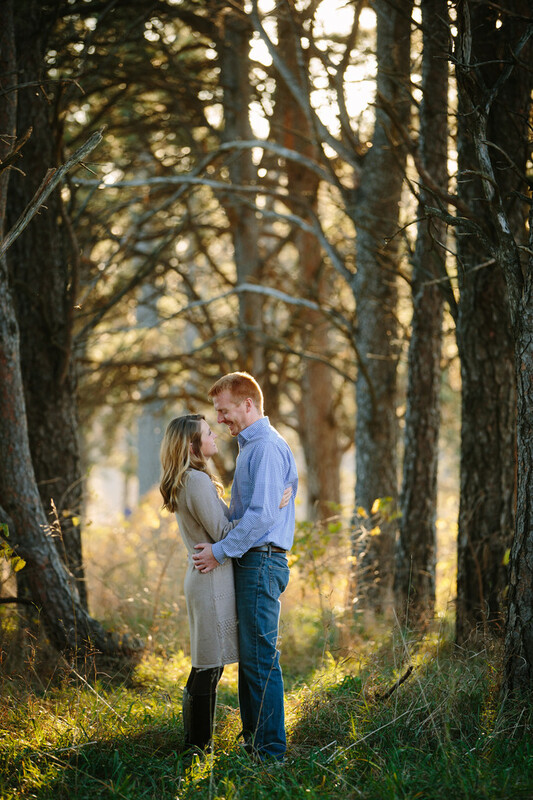 Tony Arens and Katie Ellerbee had the most gorgeous engagement session at Pioneers Park in Lincoln, Nebraska. One of my favorite images was taken in the wooded area near the Van Dorn entrance of the park. Nebraska weather is always a little unpredictable and it took rescheduling the session three times before we could finally find a day with cooperative weather. It was well worth the wait and the light and temperature could not have been nicer. For engagement sessions I tend to be very picky about the weather. With a wedding day I have no control and can't promise it won't rain or even be a blizzard, which is the reason that I try to make sure we can get a nice day for the engagement session. Tony and Katie are two of the sweetest people and just absolutely adore each other. I love the way they are looking at each other in this image. The session was photographed in the late afternoon in October, about an hour before sunset so we could take advantage of the beautiful evening light. I used a 70-200mm lens at 200mm to focus on the couple and blur the background so Tony and Katie could be the focal point of the image. Location: Pioneers Park, 3201 S. Coddington Ave, Lincoln, Nebraska 68522.